IT’S THE QUESTION that was on everyone’s lips when the cast of Anchorman 2 jetted into Dublin last week. When they’re in the Londis queue for a quick snack before the premiere, which shiny red foiled pack would they be reaching for under the counter when they reach the till? Tayto, or King? It’s the clash of the titans that will seemingly never be laid to rest. In our never-ending quest to settle the burning question that has divided families across Ireland, we decided to ask the Channel 4 news team ourselves. Let them have the final say. Will insisted on closing his eyes to taste the crisps to ensure a fair fight. He ate the two crisps in quick succession and chose Tayto without hesitation. Is Tayto the hipper one? King couldn’t bring it. Steve described Tayto as “nice, light, crispy, flavourful, complex, layered. Bold”. While King was “more potatoey”, there was less seasoning and it was “made of heartier stuff”. David clears his palette between crisps and also does the test blind. He agrees with Ferrell, and it’s a resounding vote for Tayto. Rudd thought that Tayto tasted “vintage” but King had a “thicker, hardier substance” to it. It’s pretty hard, they were both pretty delicious. They were both great, but then there’s that thing about the last one you taste, it’s on your lips. He felt that Tayto “was lighter”, and King was a bit of a “heavier chip,” eventually choosing King. Controversial. By the way we conferred with each other (They didn’t, they totally didn’t), we didn’t want to offend anybody. I love Tayto, I always get Tayto. But King just trumped it. Let’s get real. So there you have it. Sleep well tonight, safe in the knowledge that the Channel 4 news team evenly distribute their loyalty to the traditional, Irish, cheese and onion crisp. While this scientific experiment has made no leeway in determining the true winner, it seems that the battle will never be truly won. 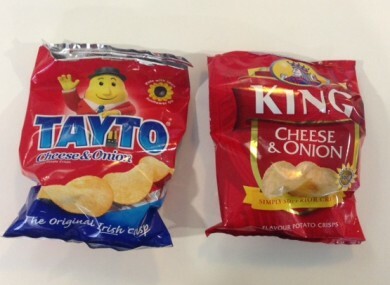 Email “Anchorman cast take the ultimate Irish taste test: Tayto versus King”. Feedback on “Anchorman cast take the ultimate Irish taste test: Tayto versus King”.